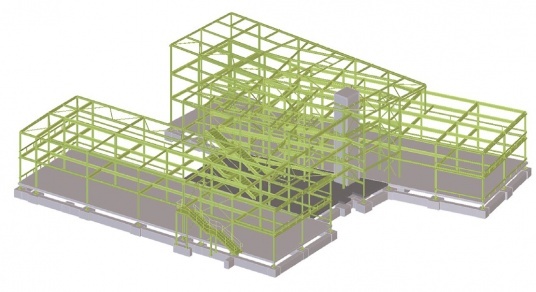 A steel-framed solution has created the desired contemporary and cost-efficient headquarters building a leading Lowestoft employer wanted. 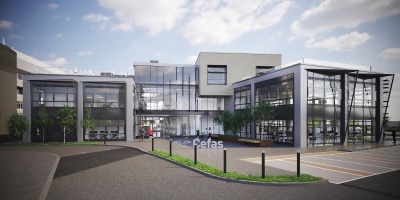 Based in the Suffolk coastal town of Lowestoft since 1902, the UK marine science agency Cefas (The Centre for Environment, Fisheries and Aquaculture Science) is constructing a new £18.3M contemporary headquarters building. This sustainable – it will have a green roof with in-built photovoltaics – steel-framed landmark HQ forms a central element of a much larger scheme that also includes the phased floor-by-floor refurbishment of an existing 1980s laboratory building. Facilities currently housed in the former Grand Hotel and Experimental Block will be rehoused in the new build, allowing these two old buildings, which are deemed inefficient, to be demolished, thereby freeing up a large part of this seafront site for extensive landscaping and car parking. According to Cefas, the new facilities will create greater opportunities for collaboration and innovation among the organisation’s employees, local marine and research networks and the international scientific community. The new building will house offices and meeting rooms, arranged either side of a spacious double-height glazed atrium and main entrance. On plan, the structure is a skewed H-shape, with a two-storey part arranged along one side and a two and three-storey element on the other. The central atrium will house the building’s communal facilities such as toilets and kitchens, vertical circulation as well as providing breakout spaces, informal meeting and relaxation areas. 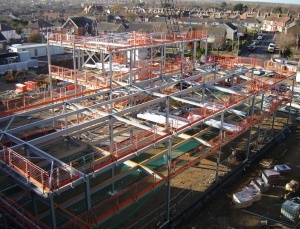 Steelwork contractor H Young Structures erected the main steel frame in a six-week programme and will return later in the year to add a link bridge and staircase, which will provide access between the existing facility and the new building. “Although the overall tonnage is a modest 117t, the piece-count of individual steel members is quite high as the building is skewed and requires numerous small sections to infill the shape. This meant the number of individual crane lifts was also high,” says H Young Structures Director Ian Peachment. The building has a composite design with steelwork supporting metal decking and a concrete topping. “After a value engineering exercise the design was changed from a precast floor design to metal decking as it was more practical and easier to install due to the skewed nature of the structure,” says Mr Bassett. 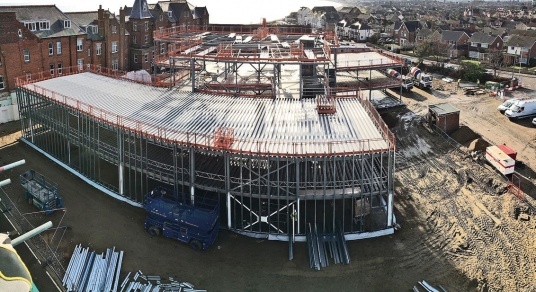 Working on behalf of H Young Structures, Composite Profiles will ultimately supply and install 1,850m2 of Tata Steel ComFlor 80 metal decking for the structure, along with 1,040m2 of Tata Steel D137 RoofDek, 520m of edge shutter and 5,000 shear studs. Most of the steel frame is based around a regular 6m column spacing, with internal spans of up to 12m. This was deemed sufficient to provide the new building with modern open-plan office and meeting room spaces. The office space has been designed to be as open as possible to enable flexible working arrangements that can change over the years as employment patterns and technology evolves. “All of the internal columns and beams will be left exposed, while the underside of the metal decking flooring will also be visible. It’s very much a function over form design, but it does give the entire building the desired modern industrial feel,” says MLM Group Project Engineer Steve Dillon. Stability for the steel frame is provided by cross bracing, positioned along internal partitions and elevations where there are no windows. The one exception is the northeast corner of the new build – the area closest to the existing building and close to where the link bridge will be positioned. Here a moment frame has been inserted as the window positions meant bracing could not be installed.